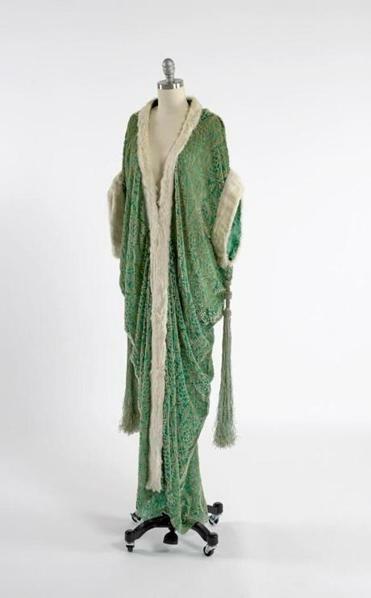 A circa 1930 Deco robe is on exhibit at Fruitlands Museum. RECREATION’S ROOTS “Leisure Pursuits — The Fashion and Culture of Recreation” at Fruitlands Museum focuses on the sociological change that occurred around the turn of the 20th century, when an increasing segment of the population began to pursue the kinds of sports, games, and outdoor activities that were once accessible only to aristocrats. Items ranging from fishing waders, to linen dresses, to photographs of people enjoying the outdoors reflect society’s newfound interest in gardening, entertaining, fitness, water activities, and equestrian sports. The exhibit is on view now through March of 2019. Fruitlands Museum is located at 102 Prospect Hill Road, Harvard. For entrance fees, hours and more information, call 978-456-3924 or go to www.fruitlands.thetrustees.org . STATE OF CLAY The Lexington Arts & Crafts Society Ceramics Guild presents the 10th Biennial State of Clay, a juried show comprising original and innovative ceramic work, now through June 3. Emily Zilber, curator of Contemporary Decorative Arts with the Boston Museum of Fine Arts, juried the show. The Lexington Arts & Crafts Society gallery is located at 130 Waltham St., Lexington. For hours or more information, call 781-862-9696 or go to www.LACSma.org. NATURE IN ART “Melody of Color,” a group show that celebrates nature’s emerging vitality, is on exhibit now through July 3 at Three Stones Gallery, 115 Commonwealth Ave, Concord. Artists in this exhibit include Astrid Benham, liquid acrylic; Kate Dahmen and Craig Dunn, watercolor; Elisa Drumm Van Auken, 3-D painted wooden portraits; Margot Kimball, conté crayon; Marlowe Miller, mosaic glass. Emily Passman, oil; and Afsoon Shahriari, digital archival prints. For hours or more information, call 978-254-5932 or go to www.threestonesgallery.com. CHAMBER MUSIC The West Stockbridge Chamber Players perform at 7 p.m. on Monday, May 21, at the Lutheran Church of the Newtons, 1310 Centre St., Newton. The program will feature Crusell’s “Rondo for Two Clarinets and Strings”; Mozart’s “Adagio & Fugue in C minor K. 546”; Bach’s “Cello Suite #3 in C Major, BWV 1009”; Scriabin’s “Romance for Horn and Piano”; and Verdi’s “String Quartet in E minor.” Tickets are available at the door for $25 for adults and $10 for students. For more information, e-mail newtonlutherans@verizon.net. YOUTH ORCHESTRAS Indian Hill Music School presents its three youth orchestras in concert on Monday, May 21, at 7 p.m. at Littleton High School, 56 King St., Littleton. Tickets are $10 for adults; free for age 18 and under. For more information, call 978-486-9524 or go to www.indianhillmusic.org. LISTEN UP The Security Project, featuring musicians who performed with Peter Gabriel and King Crimson, will perform the music of Peter Gabriel and Genesis at The Center for the Arts in Natick, 14 Summer St., Natick on Friday, May 25, at 8 p.m. Tickets are $30 members; $35 general admission. For tickets or more information, call 508-647-0097 or go to www.natickarts.org. The DayBreakers perform a blend of folk-rock melodies. blues guitar and rock on Friday, May 25, at 8 p.m. at the Black Box Theatre, 15 West Central St., Franklin. Cash bar available. Tickets are $10 in advance or $12 at the door. For tickets and more information, go to www.theblackboxonline.com or call 508-528-3370. TALENT FOR A CAUSE Mind reader Eric Dittelman, seen on “America’s Got Talent,” will perform at his alma mater of Westborough High School on Thursday, May 24, at 7 p.m. The event is a fund-raiser for In Your Shoes, a nonprofit organization working to provide assistance for those in the Westborough community who are in need. Tickets are $20 for adults and $10 for students/seniors. To purchase tickets in advance, call 508-366- 9616. FOR THE BIRDERS The Wellesley Conservation Council is offering a series of free morning bird walks every Sunday in May. Beginners and novices are welcome. Binoculars, guide books, and waterproof footwear are advisable. All bird walks commence at 8 a.m. Sundays from the parking lot at the corner of Cameron and Washington Streets, Wellesley. For more information, go to www.wellesleyconservationcouncil.org/bird-walks.html.